The unit is designed for use in confined or leeside space in case of ammonia leak occur with the high air flow so ammonia gas is ventilated from that area rapidly. Mobile designed with the following technical data. ITC designs this fan “Ammonia Evacuator” to eradicate the leaking ammonia gas by blowing ammonia out and dissolving it in the atmosphere. This is emergency equipment which plays an essential role in providing safety in work field areas. 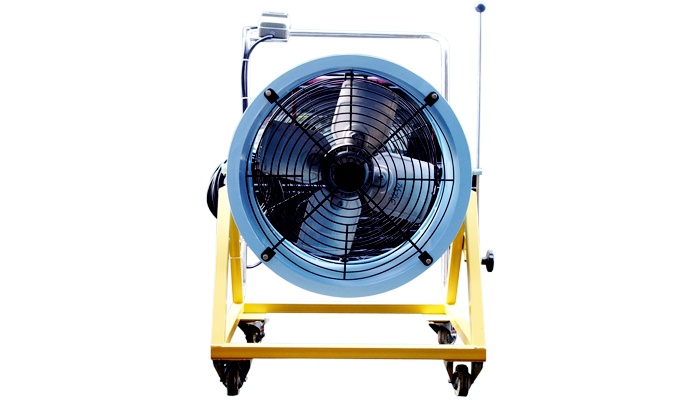 The fan can rotate at 1,370 rpm which creates a huge airflow of 8,000 m3/hr. Furthermore, the fan’s blades are made from high quality aluminum. Also, its guard and housing are steel coated with powder paint which appears a genuinely stylish evacuator. Therefore, ITC designs this equipment to be premium quality, reliability and durability. Among other evacuators in the market, this is the most competency machine that you have ever known.